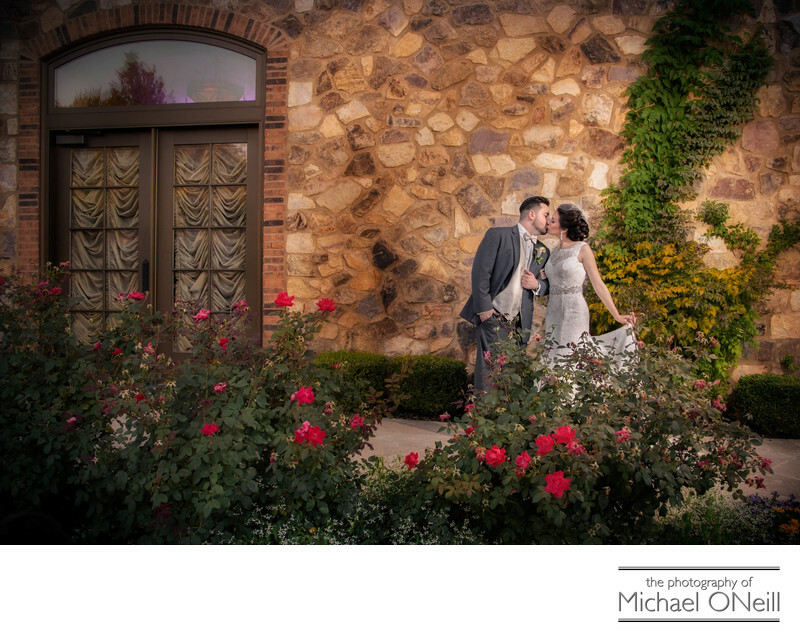 This casual wedding photograph of the bride and groom was taken at Larkfield Manor in East Northport, NY. This amazing wedding reception venue is located just minutes from my studio and gallery and has been the home to literally hundreds of weddings that I’ve photographed in my career. To say I have experience working at Larkfield would be an understatement. Larkfield Manor underwent extensive renovations a few years back and now stands as one of the most amazing wedding reception venues from a professional photographer’s standpoint. The photo opportunities here abound. The main entrance to the building is a stunning study in wood and stone. Entering the impressive lobby you find yourself looking at the grand staircase directly ahead. The ballrooms are large and elegant. A patio in the rear is the perfect location for an outdoor cocktail hour or an intimate, private wedding ceremony. At the east end of the property you will find the beautifully designed and perfectly maintained gardens that feature a reflecting pool, foot bridge and stunning night time lighting. There are areas all around the building which lend themselves to fine wedding photos including the one you see pictured here...which usually just serves as an access and loading area for your wedding vendors (DJ’s, Bands, Orchestra, Florist, etc). I am probably one of the most experienced professional wedding photographers working at Larkfield Manor today. I am certainly the most conveniently located.